The Spin Fiesta Casino provides a refreshing take on online gambling. Discover how they do things differently with their software & customer support and how they are able to leave the competition in their trail. Spin Fiesta Casino is a new casino from the ProgressPlay Limited Casinos group. Founded in 2016, this is still a brand new online casino who is yet to make a name for itself in the industry. As such it will be difficult to determine whether they are up for the task or if they'll wither away quietly in the coming years but we've put all the information available to us into this review to see if we can find out. Spin Fiesta Online Casino has been licensed by both the Malta Gaming Authority as well as the UK Gambling Commission. This opens up a wide range of possibilities for them in terms of where they're able to trade. There are also some restrictions included and thus far they are unable to trade in a number of countries including, but not limited to the following, Belgium, Bulgaria, Cyprus, Denmark, Estonia, Finland, France, Germany, Greece, Hungary, Ireland, Israel, Portugal, Romania, Spain, Turkey and the United States. It would seem that their focus is mainly on the European market in that they support a variety of currencies from there including Euro, British Pounds and Swedish Kroner, they also support US Dollars despite not being available in the US but this makes it easier for international players. Their website is only available in a single language though, that being English. The focus at Spin Fiesta is not only to be available online but also on mobile devices. They have thus made a lot of effort to make as many of their games available on mobile. Spin Fiesta games are dedicated to bringing their players a good variety of top quality casino entertainment. As such they've partnered up with some of the best software developers in the industry and just to be safe they've also included a few others that are less known in order to add some unknown gems to their games list. The titles available at Spin Fiesta Casino games section are created by the following companies, Microgaming, NetEnt, Cryptologic, 1x2 Gaming, Blueprint Gaming, Genesis Gaming, Quickspin, Rabcat, Thunderkick, 2 By 2 Gaming, Big Time Gaming, Elk Studios and Lightning Box. Thunderkick is relatively new to the online casino industry having only been founded in 2012, however in that short time they've received quite the reputation for building some of the weirdest and most entertaining slot games in the world. This comes as no surprise as it's said that the founders of Thunderkick were all members of other software developers at first, NetEnt being one of them. Their youth is reflected in every game they create which is actually a good thing because it lets them think outside the norm. This has resulted in some outrageously funny games such as Esqueleto Explosivo and Birds on a Wire. Their slogan is, "We are Thunderkick, and we make games", which is right to the point and we like it. Looking at the actual games at Spin Fiesta Casino, we were amazed by the number of offerings although considering the number of software providers on call this should have been a given. Their games range from slots, to table games, to a live casino and even include some scratch games. Slots are the main attraction here as is the case with most online casinos and as such we can expect a huge number of great slot games to be available. No modern casino can boast a complete slot list without including at least a few branded slots to capitalize on the latest movie, series and music trends. Some will love playing a slot game based on a recent movie they fell in love with while others will bathe in the nostalgia provided by some older names. Some of the branded slots on offer include South Park: Reel Chaos, Dracula, James Dean, Jimi Hendrix and Scarface. Next we head over to the casino games section and find another impressive collection of titles. All your favourite genres are included such as Blackjack, Poker, Roulette and a range of games that don't generally fall under table games. Here are some of the games to look forward to. While the next selection may be somewhat limited, they do also offer a hand full of live casino games which should be enough to satisfy most. Among this list are Baccarat, Multi-Player Baccarat, Multi-Player Blackjack, Roulette and Multi-Player Roulette. Finally we head over to the scratch games which is generally the least popular but still they've included a good range of options here as can be seen below. On first glance they do appear to have all their bases covered in this department and any criticism here would be nitpicking. Special promotions can make or break a casino. Some offer so many that players don't even pay attention to all while others only offer one or two and then leave the players to their own vices. Spin Fiesta brand is one of the former with an unbelievable number of special promotions on offer, a breakdown of which can be found below. Any player who does not yet have an account with Spin Fiesta may sign up today and immediately qualify for their welcome bonus. All that's needed is for an account to be registered and a deposit to be made after which the player will receive a 100% deposit bonus up to an amount of £/€/$200. While there is no minimum deposit amount required to qualify for this bonus, players will need to meet a wagering requirement before they'll be able to withdraw any of the bonus funds. The wagering requirement at Spin Fiesta Casino is 50 times the bonus amount which is a little higher than the industry average but nothing too serious. Unfortunately certain regions fall under different jurisdictions and thus have to meet a 100x wagering bonus before being able to make a withdrawal. 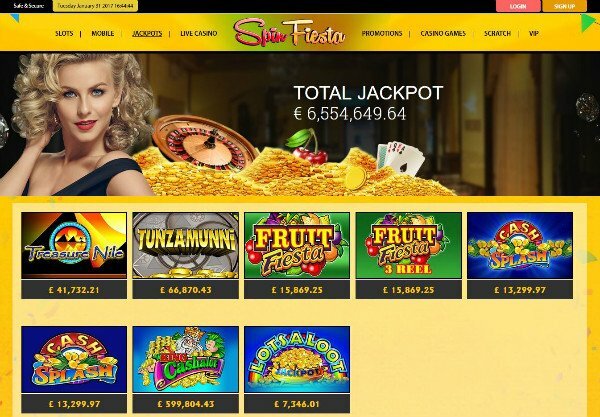 December is the ultimate holiday period and in celebration of this spinfiesta.com is offering free spins daily simply for logging in. Players who log into their accounts will automatically receive the free spins along with instructions on where they may be played. Playing NetEnt games in 2016 could put more than just a hefty jackpot bonus in your pocket. A number of lucky members at Spin Fiesta Casino will also become part of a prize draw at the end of the year where cash prizes to the amount of €10,000 will be given away and one lucky winner will receive a holiday trip to Finland. Spin Fiesta Casino chooses a new game every Wednesday to give away some free spins on. Players simply need to log into their accounts and if they've made a deposit in the last week, they'll receive the spins and the game to play them at. Mondays are the worst, at least they used to be until Spin Fiesta stepped in to save the day. A first deposit made on Mondays will instantly be doubled up to an amount of £/€/$50. If that's not enough then making a second deposit will reward with a 50% bonus up to £/€/$100. This is a randomly selected bonus amount, given to a randomly selected player at a randomly selected day and time. The more they play, the better their chances of winning. To claim the Thursday Cash Back bonus players simply need to make a minimum deposit of £/€/$30, contact the support team to notify them of the deposit and they'll receive 10% back. It's as simple as that. During specified weekends players will be able to contend for some cash prizes by playing their favourite casino games. The more they play, the better their chances of winning up to £/€/$100. While the theme at Spin Fiesta is nice to look at, they didn't do much with it. The background displays some confetti flying through the air to show that a celebration of sorts is underway but apart from the banner on their home page, there's no other indication of this. The layout however is great. A large navigation bar at the top has all the important links such as games, promotions and VIP access. The games are also neatly displayed in a tile format and shows a good number of games while not feeling too crowded. Overall, it's not a bad design but in our opinion they could have added a bit more "fiesta" to it. The first thing we tend to do when assessing the value of a company's customer service is check out their FAQ section to see just how much effort was put in there. The more information available here, the better their score. Spin Fiesta Online Casino scored high in this regard by offering a lot of information under various categories as well as a quick browse bar at the top that will send users directly to the category they're looking for. Categories available include Registration, Verification, Accounts, Deposits, Withdrawals, Limits, Technical and General Questions. One thing we do like to mention though is that they d of this page could be a little more optimised. Perhaps not so much the layout as the design because the entire page is just a wash of text with nothing separating the sections. In our opinion, just adding some formatting here would make a big difference but this is only a minor complaint. Should the FAQ section not be effective in answering a query then players may still contact the support department directly. They have two options available, email and live chat but unfortunately no phone support. Live chat is generally the preferred option as it's quicker while email responses tend to take hours or in some cases even days. To make things easier there's a "Help Chat" option right at the top of every page so no player ever needs to wander around, looking for help. Their support is also available 24/7 which is a feat even some of the most experienced online casinos still struggle to master. Spin Fiesta has included a good number of payment methods to their list, among others: Maestro, Mastercard, Neteller and Sofort. Most of these methods are available for withdrawals as well baring a few exceptions. When requesting a withdrawal players will need to wait up to 72 hours while the transaction is reviewed. From there eWallet payments will be processed within 24 hours with card payments taking 6 days and bank transfers up to 10 days. Overall we were very impressed with spinfiesta.com, especially considering how little experience they have as a company. They've employed the very best software developers and gained an excellent number of games to ensure their players never become bored. They also offer an incredible number of special promotions so new and existing players will always feel appreciated. The one gripe we have is the long processing times for withdrawals but as far as problems go, this isn't a deal breaker. 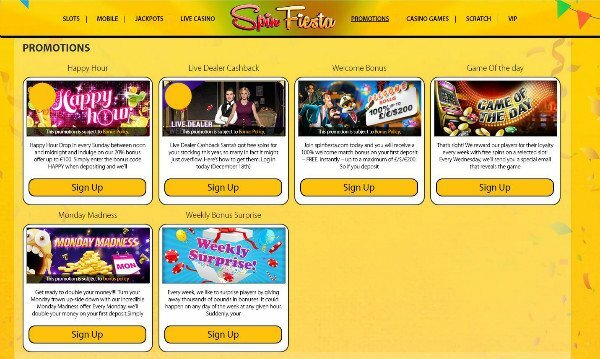 We feel that anyone who's looking for a new online casino destination can definitely give Spin Fiesta a shot and we suspect they won't be disappointed.